Ælred of Rievaulx’s De institutione inclusarum treatise, written in mid-twelfth century England, is often studied as the first in a growing trend of advice literature written by medieval clerics for female recluses. However, while subsequent literary trends tell us that Ælred’s text formed the basis of later recluse literature, Ælred himself did not write within a milieu of recluse literature. Rather, this article argues that Ælred’s treatise fits very closely within the twelfth-century trend of monastic institutiones, that is, documents written by and for monastic audiences in order to provide supplementary guidance to use alongside monastic regulae. This article demonstrates that the Cistercian monk Ælred took the initiative to provide pastoral advice to a number of religious women, particularly those who participated in two of the twelfth-century’s new and as-yet unregulated religious experiments, that is the new Gilbertine monastic order and the newly popular life of the recluse. 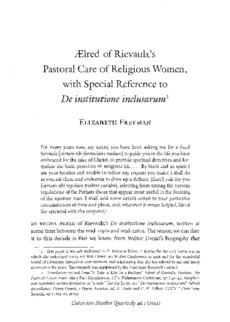 Whereas previous scholarship has often argued that medieval Cistercian monks were antagonistic to, or indifferent to, the religious lives of medieval women, this article shows that Ælred of Rievaulx was a monk who took the religious vocations of women very seriously.